Spin the reels of the slot that takes you to the outback in the land downunder, the 20-payline Kangaroo Land slot machine by EGT available for free play at Slotorama! Spin the reels of the slot that takes you to the Australian outback in the land down under, the 20-payline Kangaroo Land slot machine by EGT available for free play at Slotorama! This fun game comes to you with some fantastic photo-realistic images and a top jackpot of 40,000 coins! 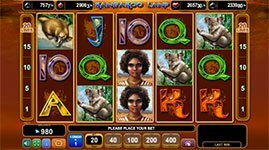 Kangaroo Land is set on a brown and orange background which is not common for online slots but seems to really work with this game. On the reels you’ll find all sorts of themed symbols like Aboriginal characters, koala bears, ostrich, duck-billed platypus, white cockatiel birds, a boomerang scatter and a kangaroo wild. Filling out the symbols are the traditional card symbols of 10 through ace. Kangaroo Wilds – The Kangaroo symbol is the wild and appears on the 2nd, 3rd and 4th reels. It will substitute for all symbols except the boomerang scatter to complete winning combinations when possible.